Unfortunately for many hardware manufacturers, there are only so many things you can create to help with the gaming experience on the Xbox 360. You can get better TVs, audio equipment, controllers (including mods), and I guess some premium seating. Aside from that, all you need is the game console, some cables, and the game itself. Of course you can buy battery chargers and lights but does this impact your gameplay? No. So when you buy headphones, it’s one of the few big purchases you’re going to make aside from the game console and the TV. Everything else is usually a bit less expensive. Turtle Beach knows this and has a brand line for the Xbox that actually makes sense. Higher numbers indicate a better model. They expand on features, sound quality, and coolness. But in all seriousness, they have a headset for anyone with any price range. Naturally we wanted to see what the best of the best offers. 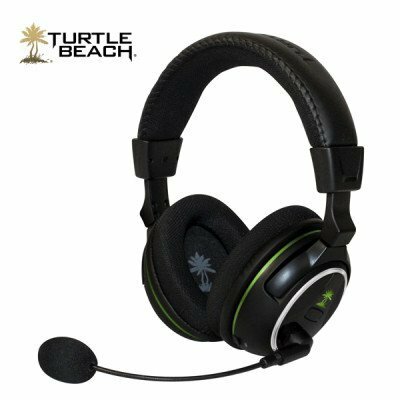 The Turtle Beach Earforce XP500 (MSRP $269.95) represents some of the latest and greatest technology you can put on a gaming headset. FEATURES: The XP500 offers a few key features. First and foremost, it’s wireless. Make sure that your gaming environment is conducive to this. Being one of the writers for a gadget review site, I naturally have a lot of wireless devices, which I will bring up in more detail later. The second feature is Dolby 7.1/5.1 Processing (including Pro Logic II and Stereo). The third is customization. Not only does this have 8 audio presents for different sound modes, but you can also download free software from the site that lets you customize EVERYTHING. Make footsteps louder, have bigger explosions, morph your voice, whatever you can think of. The last major benefit is Bluetooth capability, including wireless Xbox Live chat, and pairing with your cell phone. WHAT YOU GET: Opening the package reveals a few cables, the transmitting station, the headphones, Bluetooth controller adapter, and the document kit. Connection is very simple, and you’ll want to utilize the included optical cable to get the surround sound to work correctly. The transmitting station includes an optical out bypass so you can keep your digital sound system in tact. Also included on the station is a line in jack, line in volume adjustment, headphone out with volume control, Dolby bypass button, and status LEDs. he beginning because the gadget test room is loaded with different equipment, including a router, laptop, and more. I had the reported cutouts and pops that some have associated with wireless headphones. I disabled the wireless broadcast which also stopped the laptop from downloading files through WiFi. The difference was night and day and I was ready to enjoy the XP500s to their potential. GAMING AND AUDIO EXPERIENCE: This is ultimately what you pay for. High fidelity sound, audio enhancements, and an advantage during gameplay. I tested these while playing multiplayer on Modern Warfare 3. It was important because one of the advertisements made was the footstep enhancement preset. I was playing on Seatown (multiplayer map on MW3) which is a close quarters map. Any advantage to reaction time is huge. Switching to the footstep audio preset certainly boosts the footsteps of friends and enemies. It’s important to note that boosting these frequencies will result in lower quality sound (explosions, etc). If your sole goal is to hear people sooner and louder, this mode is great. It worked almost so well that I would find myself turning to look left and right to a point where it would disorient me and I’d die as a result. Friendly footsteps can be confused with enemies. The good news is that a quick button press on the headset itself switches audio modes (my favorite being Bass and Trebble Boost) and you’re good to go. This truly gave me an advantage and I found myself shooting a fraction of a second before they came around the corner. This is huge if you’re a competitive gamer and enough of a reason to make a purchase like this. Fatigue is almost non-existent. I had the headphones on for over two hours straight without ear pain or discomfort. Not many companies can boast about long term comfort. Add in amazing sound quality and gaming advantages for a truly worthy upgrade. SPECIAL FEATURES: Bluetooth is great for Xbox chat. I can hold the controller completely cord free and still chat with my friends on Xbox which is nice. What I love about the headset is the ability to pair with my cell phone. The process takes less than a minute. The headset allows me to have game audio, wireless chat, and Bluetooth to my phone simultaneously. I can answer the phone by tapping a button on the headset. Double tapping it allows me to redial my last contact. I can even stream music from my phone while I play, and control game and Bluetooth volume independently. 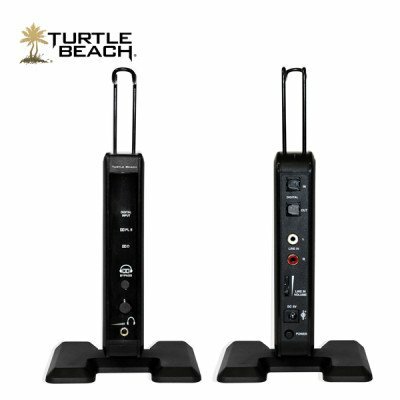 Turtle Beach allows you to download a special program here to fully customize your gaming experience. Modify your voice, limit explosion volume to protect your ears (Ear Guard), enhance the audio for each specific game, and more. This software can be simple, but you can make it incredibly advanced and complex if you have the time and mindset for it. It’s always good to have more options and not need them, than to not have enough and wish it were there. FINAL VERDICT: This headset truly sounds amazing and it’s hard to compete with. Battery life lasts an incredibly long time and everything you need is included in the box. Is it for everyone though? Not necessarily. If you have a very confined space and are forced to deal with multiple wireless devices, I cannot guarantee you won’t have the occasional audio drop out, or pop, if you will. This is common with all wireless headsets, regardless of brand. Turtle Beach makes excellent wired headphones as well should you prefer that. But if you want the ultimate audio experience, with features beyond what you can fathom, look no further than the Turtle Beach XP500.